Since the discovery of the Nepal stash of old British Martini-Henrys and Sniders a need for ammunition for these old guns just got greater. 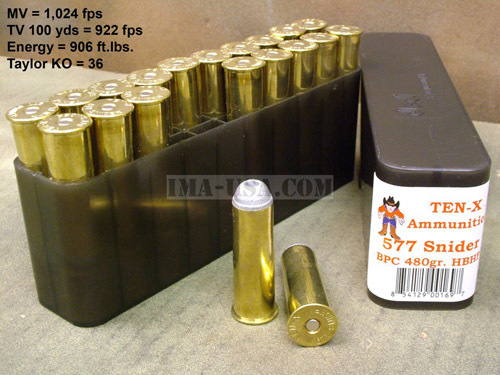 There was always a demand for such ammo, but now that there are lots of these guns floating around a company can now afford to make it available. Ten-X together with Jamison International and Buffalo Bullet Company now produce .577 Snider and .450/.577 Martini Henry ammunition. The brass is correctly head-stamped, and the Martini round is said to hold 4 inch groups at 50 yards, and 6 inch groups at 100 yards with open sights, with velocities lower than 1350 fps, using the latest black powder substitute. The ammunition is boxer primed and reloadable, and Ten-X says they will even reload your brass after you've shot 'em up. The ammunition is available at dealers (you can find them at their website) or you can get it from IMA.